Arizona Governor Agrees To 20 Percent Raise For Protesting Teachers : The Two-Way Gov. 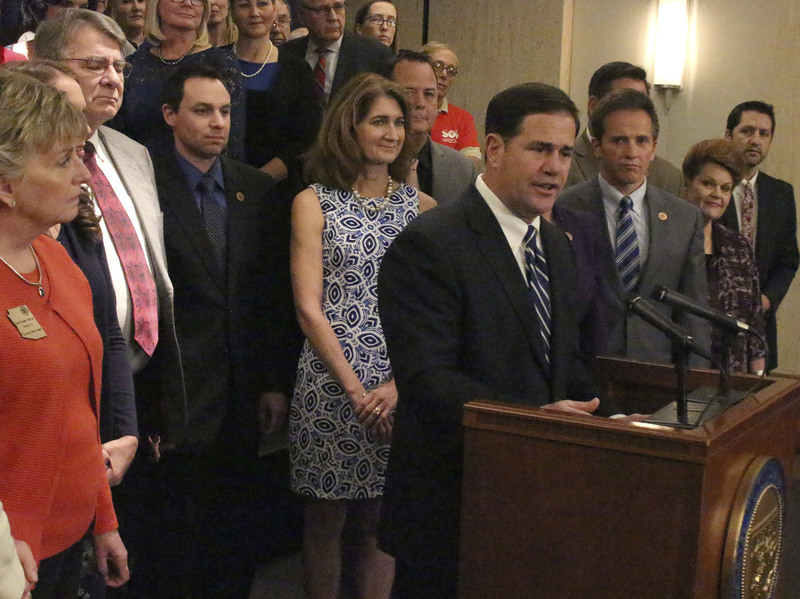 Doug Ducey gave in to some of the educators' demands and promised to boost teacher salaries in increments over three years. Arizona Gov. Doug Ducey on Thursday announced a 20 percent pay raise by the 2020 school year. Arizona Gov. Doug Ducey has given in to demands for pay raises for teachers, who have been conducting a month of protests at the state Capitol and at schools. He has proposed to boost teacher salaries 20 percent by 2020. The Associated Press notes that the educators "were also seeking increased pay for support professionals, a permanent raise structure, and a freeze on corporate tax cuts until per-pupil spending reaches the national average." Ducey's proposal didn't include more spending on those items. "'What he gave us today was just a proposal, it wasn't legislation, and we don't know where the money's coming from and we don't know if he's talking about everybody involved in education or just classroom teachers,' Tucson teacher and Arizona Educators United organizer Derek Harris said. 'There so many more of us that need it than just classroom teachers.' "
The governor's action came as the teachers were threatening a walkout over low pay. On Wednesday, Arizona teachers staged a statewide "walk-in," demanding an increase in pay and more funding for schools overall. And, organized by a recently formed advocacy group, Arizona Educators United, teachers had also discussed the possibility of staging a walkout if Republican lawmakers refused to reinstate about a $1 billion in cuts in state education funding over the last decade. The governor's proposal includes a 9 percent increase that would go into effect this fall, bringing the median teacher salary in Arizona to $52,725. Ducey also pledged to give teachers a 5 percent increase in the fiscal year 2020 budget, and another 5 percent in the year after that. Those increases, coupled with the 1 percent increase teachers were given last year, would add up to the 20 percent raises and make the average teacher salary $58,130, Ducey said. As Casey Kuhn, reporter for NPR member station KJZZ wrote, Arizona teachers are among the lowest paid in the country, according to federal data. Average salaries last year were actually $8,000-$9,000 less than 1990 salaries when adjusted for inflation. Meanwhile, Oklahoma teachers on strike now are rethinking their strategy after a nine-day walk out. The head of the state's largest teacher's union, Oklahoma Education Association President Alicia Priest is calling for the group to shift tactics and focus on electing "pro-education" candidates to the State Legislature.